This accelerator board is a 33Mhz clocked MC68HC000 CPU with 8MB of FastRAM which is running at the CPU's clock speed. It incorporates an 40-pin IDE interface which can power an IDE Flash DOM without a power lead (using pin 20) if the device supports it. A header is provided for an LED activity indicator. Wiring solution left to the owner. SysInfo reports it as a BSC Oktagon 2008 Z2 memory and a BSC Oktagon I/O device. The board appears to leverage a scsi.device named driver with the JP1 jumper on (appears KS 2.0+ friendly), or uses an oktagon.device with the jumper off (KS 1.3+ friendly). Either performs much better than the IDE interfaces on native Amiga systems. On-line research indicates that the newer-OS friendly scsi.device may support newer and larger media, but no documentation is available to confirm this. scsi.device v109.3 and oktagon.device v6.10 reported in this test board. It is designed for the A500, but may work in A2000/A1000 hosts in place of the 68000K CPU, with certain potential incompatibilities* with other hardware. - All acceleration is based on the 68000 instruction chipset, and no caches, which may improve compatibility with some software that doesn't like 68020+ CPUs or caches, or cause problems for some software that relies on native 68000 clock speeds in their their coding. - The IDE interface with a capable drive or flash DOM is capable of 4-5MB/sec. - There is no indicated fall back option to 7Mhz mode. - No jumper wires or motherboard modifications needed, sans the careful removal of the 68000 CPU. 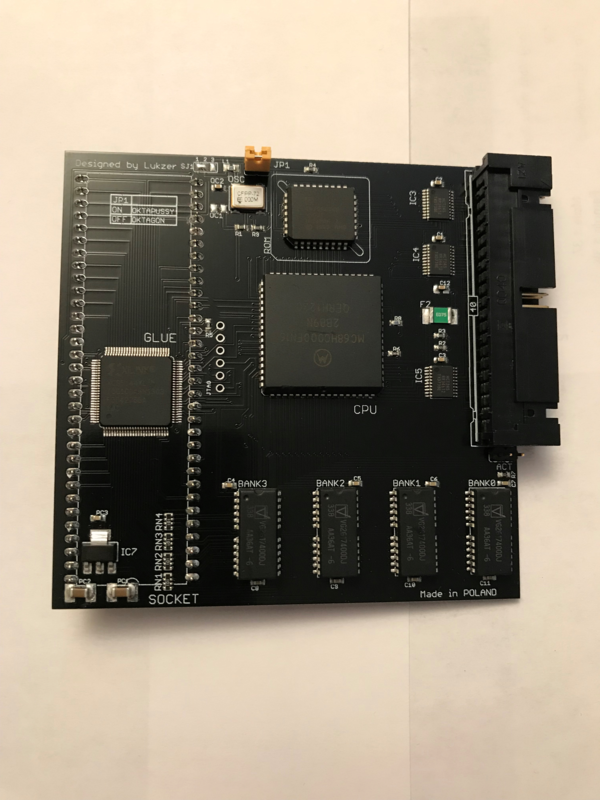 - There may be ~1 additional standard machine-pin socket of clearance available to raise the CPU board over a tall ROM in a socket or adapter, but it may be necessary to use ROM switcher gear that is on a ribbon cable to the side or the cable / flipped to the rear. 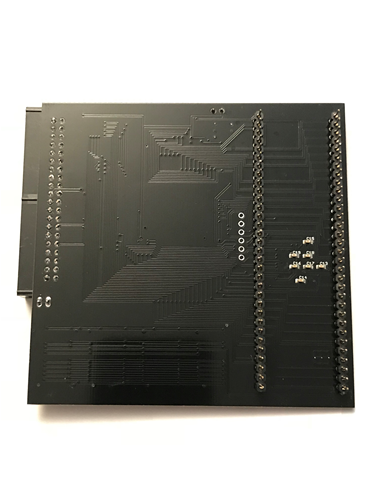 - The A500 RF shield will still fit if no additional socket/pin strips are used for raising it. Currently no manual or support software is offered with the unit. Pictured is one of the first official boards in the test production run. *The unit will function in an A1000, however, the board will conflict/intrude upon the A1000 Rev 6 riser/daughtercard space, requiring header strips and/or machine-pin sockets to raise the unit above the daughtercard. It will function and fit on top of popular Insider/Inboard FastRAM expansion products. RAM on those units are typically placed lower in priority within the memory list (@ $C00000+), and used last, before ChipRAM, if configured for that mode. *Due to the nature of the board's in-68K socket AutoConfig solution, do not expect to operate any units off the A500 or A1000 86-pin expansion slot which provides AutoConfig to expansion units. The unit otherwise provides most features desired by users with stock 68K-based machines. The board functions in A2000's on it's own, but the AutoConfig expansion card issue still applies. Page contributors: Robert Miranda (GVP Tech Support).